The Magnolia Inn is a sweet little bed and breakfast where many love stories begin. Owned by the loveliest couple Lankford & Joyce Blair. 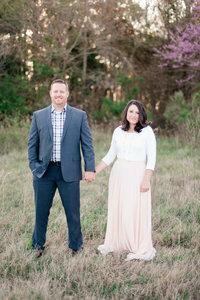 Their hearts are full when they are serving others and facilitating wedding ceremonies in their home. Luke and I always love when we get the chance we get to visit them and so do my kids! But that is another story! We were grateful to start our 2018 wedding season with this small intimate wedding at one of our favorite places! Located in downtown Hampton, the Magnolia Inn is the perfect spot for couples looking to have a small ceremony or elopement. Brian & Katie are the cutest! These two met in Pensacola, Florida. Which when anyone says they are from there I literally have to tell them I lived there for awhile as well and all my family lives there. We then go into spots we have been and Luke always has to draw a map out of the whole city of Pensacola and adjoining cities of Pace and Milton. It is inevitable each and every time! So if you are reading this and are from that area just spare yourself and tell us otherwise! Brian is in the Navy and he met Katie at a local club in Pensacola. He said that he is not one to really talk or be sociable. ( Which I don’t believe at all)! That night when he and Katie met, the conversation flowed organically. There was not trying. It was completely natural and after that moment they began seeing one another. Katie was actually not living in Pensacola at the time but after meeting Brian decided to move. Together it just made sense. Their journey has brought them to Virginia. Being in the Navy it is almost inevitable to end up in Norfolk. It is rare to be in the Navy and not spend some time here in Virginia. So now these two made it this lovely state and decided to make it official. Katie is such a down to earth girl who is crazy about Brian. She didn’t need a big wedding. She just couldn’t wait to be his wife. So as they began talking about what they wanted they both decided on something small. It made sense for them. Family came in from all over. Friends surrounded them with love and happiness. The anticipation was tangible. As they said their vows Brian began to tear up. When two people who belong together make a commitment to love and cherish one another for all of their days it is such a beautiful thing to witness. The moment these two had in that little room in Mr. & Mrs. Blair’s home was priceless. I am just glad that Luke and I were invited into such a precious moment. After their sweet ceremony, we then proceeded outside for family portraits. We were happy to see that there was no rain in the forecast. Yet with no rain, it was super cold! If you have followed Brian & Katie’s journey, then you would know that Brian is definitely not one for cold weather! However, because of his love for his new bride, he endured and we were able to get some beautiful pictures outside. Thank you to the newlyweds. You two have been such a joy to work with. I love how you laugh together and just enjoy life together. You were the perfect way to start off our 2018 wedding season! Wishing you love and happiness all of your days! As you might have been able to tell we are pretty fond of small ceremonies! If you would like to see more small intimate weddings you can visit the links below!